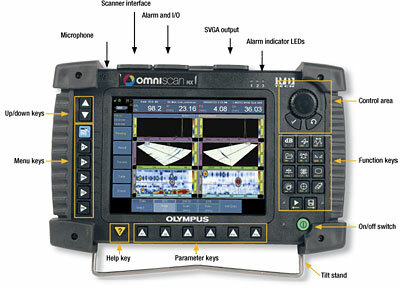 The OmniScan MX is an advanced, multi-technology flaw detector. It offers a high acquisition rate and powerful software features-in a portable, modular instrument to efficiently perform manual and automated inspections. Available with PA and conventional UT modules, and conventional EC and ECA modules. With hundreds of units being used throughout the world, the OmniScan MX is Olympus most successful portable and modular phased array and eddy current array test instrument. The OmniScan family includes the innovative phased array and eddy current array test modules, as well as the conventional eddy current and ultrasound modules, all designed to meet the most demanding NDT requirements. 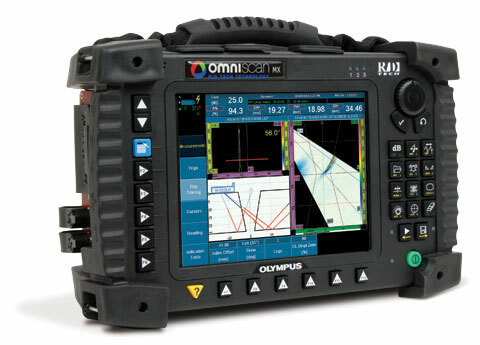 The OmniScan MX offers a high acquisition rate and powerful software features-in a portable, modular instrument-to efficiently perform manual and automated inspections. The OmniScan is built to work in the harshest field conditions. A solid polycarbonate-based casing and rubber bumpers make it a rugged instrument capable of withstanding drops and shocks. The OmniScan is so compact and lightweight (only 4.6 kg, 10.1 lb) that it can be carried easily and handled anywhere, inside or outside. The OmniScan will run for 6 hours with its two Li-ion batteries. 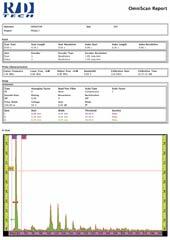 The highly legible 8.4-inch real-time display (60-Hz A-scan refresh rate) with an SVGA resolution of 800 x 600 allows you to clearly see defects and details under any light conditions. A scroll knob and function keys make it easy to browse through and select functions. A mouse and keyboard can also be connected for users looking for a more PC-like interface. The instrument allows you to switch between its different test modules on location. 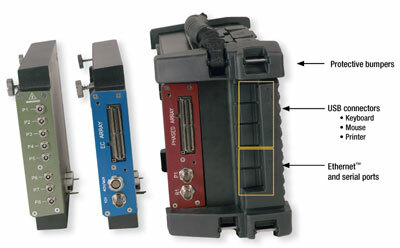 When a new module is connected, the instrument detects the module and its supported technology so that the configuration and test environment are set automatically. 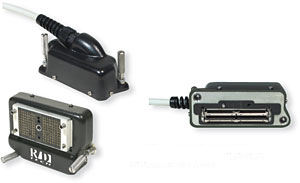 The OmniScan connector has a probe ID feature that enables physical detection and recognition of the probe connected to the instrument. Sets the probe to an appropriate frequency to prevent probe damage. Sets C-scan resolution for ECA probes. Loads the correct probe parameters. Setup storage is compatible with Microsoft® Windows® (exportable using a CompactFlash® card). Complete report setups, including reading configurations, that can be customized using HTML page layouts. The OmniScan® offers alarm outputs and standard PC ports: USB, SVGA out, and Ethernet. It offers internal data storage capability and extended storage via a CF (CompactFlash) card slot as well as any USB or network storage.